As part of this fully integrated online promotion for StarKist®, consumers could text “Kist” to a short code to opt in for links to weekly recipes posted on a custom micro-site. 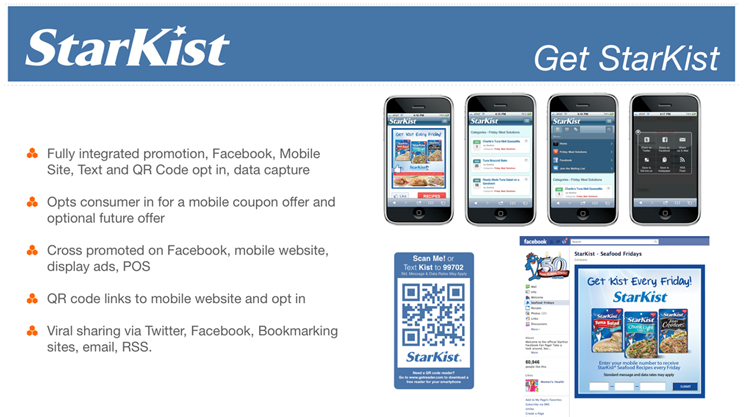 In addition, consumers could find recipes and links to the site via Facebook as well by scanning a custom StarKist® QR code. Tell-a-friend sharing was integrated with Twitter and Facebook, encouraging consumers to like the page.